For those born March 17, 1960. You're one of the first people who's never lived in a world without Barbie. In January 2016, Megan Garber wrote about Mattel's move to introduce new Barbie dolls in varied sizes and skin colors. Around the time you were born, white police in South Africa fired into a crowd of unarmed protesters, killing 69 people. In August 2012, Daniel Magaziner and Sean Jacobs wrote about a contemporary massacre of protesters in South Africa that was drawing comparisons to the tragedy in 1960. You were born in March of 1960. This year, The Atlantic celebrates its 160th birthday, making it 3 times as old as you. The year you were born, Eliza Paschall wrote about how participating in the struggle for racial equality affected her identity as a Southerner. At 9 years old, you were alive to behold people walking on the moon. American Graffiti was released in 1973. In 1976, Bono, who was born the same year as you, formed the band U2. In September 2012, Ashley Fetters wrote about U2's 1997 concert in Bosnia. 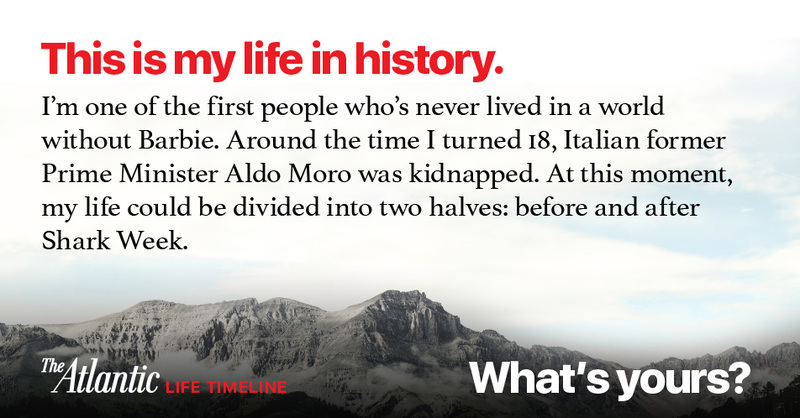 Around your 18th birthday, Italian former Prime Minister Aldo Moro was kidnapped. The kidnapping (and eventual murder) of Moro by Italy’s Red Brigades was the result of a campaign of terrorism sponsored by the Soviet Union, as Nick Lockwood wrote in 2011. Your life can be divided into two halves: before and after Shark Week. In August 2012, Ashley Fetters traced the history of cable television's longest-running programming event. When you turned 47, you watched humankind reach the outer solar system. By the time you turn 64, the World Bank predicts that the U.S. dollar will lose its global dominance.